Here is a recent photo of football star Fandi Ahmad with his sons. 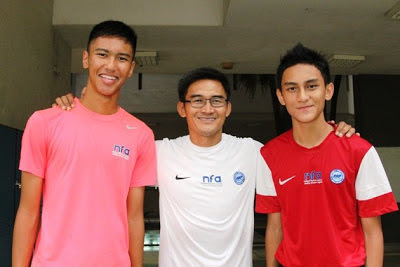 Here is former captain of Singapore’s national football team Nazri Nasir with his sons. Notice something? The father is not the tallest guy in the pictures. When my son grew taller than me a few years ago, I wasn't sure how I felt. I sort of felt proud and a little emasculated at the same time. As if he didn't have enough trouble looking up to me. And he doesn't even play football.